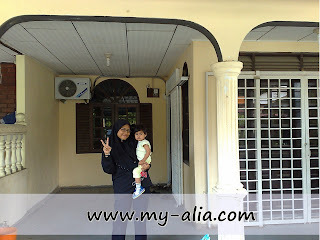 My-Alia : Bye Bye De! So this is an entry about our trip to KB (Kota Bahru, Kelantan). It was a very tiring one, as i had expected. We took off on Saturday at 8.00 am. And we took the Genting Sempah - Gua Musang etc road. We reached KB around 1 pm, and had our lunch and checked in at the New Pacific Hotel, Pengkalan Chepa. **we used to stay at the Perdana Hotel, but the hotel is now undergoing a major renovation, so we opt for this hotel instead. this is one of ALia's activity in the hotel! In the evening, we went to see / drop off Ely at her new Rumah Sewa. **before this, Ely stayed at the hostel, but eventually she is in her final year now, that's why they 'kicked' her (and her batch) out of the hostel.. And they had to find a Rumah Sewa.. So this is it! Erm.. Ahadnya kami pulang! but using the Terengganu east coast jalan. Jalan-jalan tepi pantai.. :) makan keropok lekor.. oh, how i miss Terengganu! uii bole kira kepala plak sewa rumah ni ek..mahal tu rm1000! klu kat kl bole trima la huhu..
hak arr lah. kat kelantan pun ada umah sampai 1k. ngalahkan KL plak. neway, selamat pergi dan balik. tak penat ker? hari ni kerja? hehe.. dia nak challenge KL kot.. haha..
hehe.. syok.. apa tak syoknya..